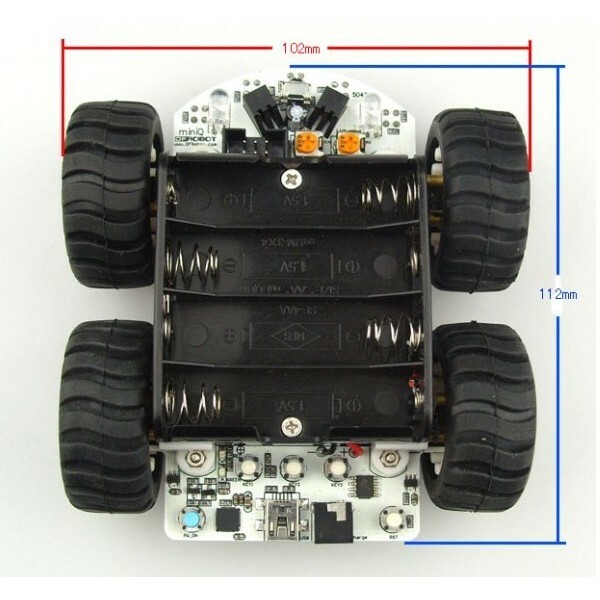 The MiniQ 4WD Robot is a complete assembled robot with an Arduino compatible brain. This robot has a full set of sensors to play with: wheel encoders, IR infrared line and edge tracking sensors and light sensors. This robot also has 3 user push buttons to make it easy to select modes and options and a buzzer for the little beeps and boops that every friendly robot since R2D2 must master. A set of four motors drives this robot at speeds up to 28 inches (72 cm) per second. Each motor has an encoder for feedback. An IR Infrared remote control comes with the set that can be used to command your robot from a distance. The robot also has the ability to send IR commands. Two or more of the MiniQ robots can talk to each other using IR. This is not a remote controlled toy but a real robot that you program yourself. It uses the popular ATMega328P microcontroller and is fully Arduino compatible. This robot comes in a nice plastic box with a mini USB cable and infrared remote. All you need to add is a set of 4 AA batteries. Download the latest Arduino IDE and choose "Arduino Nano w/ ATmega328" from the Tools->Board menu and select the appropriate Serial Port. You can now program the robot as an Arduino. 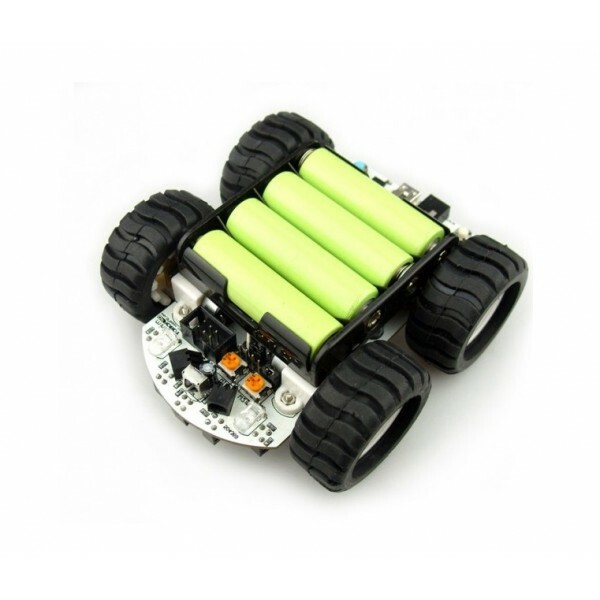 Before programming the 4WD MiniQ Robot, make sure to have 4 fully charged batteries in place. The robot runs on batteries during programming. Connect it to your computer using the included Mini USB cable and install the USB drivers from the link below. The computer will recognize it as a serial port. Press the "PWR On" button to turn on the robot. You will see a blue light on the bottom of the robot. Pot W1 adjusts the balance left and right light sensors. Pot W2 adjusts the balance between left and right infrared transmitters.